Deb's Cup of Tea: Reading. A Fundamental Right? I used to work in a bookstore and, to the left, is part of the stash in the bedroom that hasn't been read. 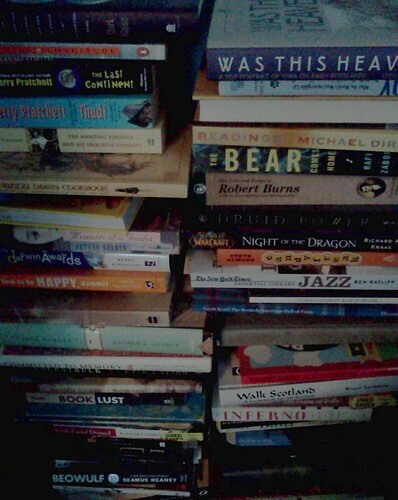 There are hundreds of books scattered about this house. Some, I will read once and never read again. Some are old friends to be returned to again and again. Most fall into the former category and I'm slowly realizing that simply having isn't really very smart when I probably won't read it again. I worked in The Bookstore at a time when independent bookstores were closing daily. Amazon had just gotten off the ground. Barnes and Noble and Borders were opening stores as quickly as they could. Waldenbooks and B. Dalton were in every mall. Small stores had to think about how to invent themselves to stay alive. They were in competition with, not only the large chains, but each other. In shaky fashion, independent book stores overcame their wariness of each other and banded together to offer people a more personalized experience and joint services that the big bookstores could offer, things like gift certificates redeemable at any independent bookstore which was a part of the network, and books offered by small presses, books the big guys won't touch because they won't sell eleventy billion. They reinvented themselves. That reinvention has allowed them to survive, if not thrive, during an era when the big stores have to close outlets or simply go out of business. Enter the e-book. Now, this is not going to be a post condemning your use of a Kindle or Nook. I feel, personally, they have allowed people who might never pick up a paper book, to read. I am going to toss some ideas into the ether for reflection. The Reformed emphasis on education was another Calvinist attribute that found approbation in Scotland. Scots had long prized education...Calvin [Johannes Calvin, the religion's founder] advocated that ordinary people should be able to read and understand Holy Scripture themselves, rather than having to rely on a priest to tell them what it said. This meant that the Bible would have to be in a language people could understand, and that they would have to be able to read that language. Naturally, this had a direct bearing on the matter of public education. At the founding of the Kirk, Knox's Book of Discipline called for a national system of education, something that was realized 80 years later when Parliament passed the first of several statutes requiring each parish to provide schooling for all its children. This legislation represented by far the world's earliest example of public education, at least on a national basis, and it would have far-reaching effects. Knox demanded that the Bible be in the vernacular in roughly 1560. It would be 1640 before the education laws were passed. This was not just for male children but ALL children in a parish. Female children did not receive an education, generally, outside of the parish, but they were taught the basics, math, science, religion and reading. From Gutenberg and moveable type, which meant a book could be printed in larger quantities, through Knox and the requirement that all be able to read, to the hiccups in literacy and the publishing industry, reading is on top of the list in skills a child should have. The medium by which we get our information may have changed, but we still must have the ability to read or nothing else matters. I've been reading lately, of the trials of the independent bookseller with regards to e-books. I don't remember how I stumbled onto Jarek Steele's blog but it's been something of an eye opener, to say the least. I love independent book stores, not just because I worked in one, but because they provide a vital service to the reading community. There is room in the vastness of retail for large stores with thousands of square footage in books. There is room for a one room 700 square foot store on the corner of 12th and Main. As long as both compete fairly, both can thrive in their niches. Steele made me aware in this post, about the cutthroat nature of e-book commerce. Let's be clear about something else. I don't like Amazon. I'm not sure if I've crossed the stream to "hate" yet but I really don't like them. I don't like their ordering methods or their customer service that can't figure out why I have 3 separate accounts and merge them into one. If I have to order something, I order from Barnes and Noble. Generally speaking, I don't order books online. I use Amazon or BN as a resource. I get the ISBN number, that 10-15 digit number on the spine or back of a book, and email The Bookstore. They get it for me. If you want something for Christmas that I can only get on Amazon, well, you're not going to get it. If you look at The Bookstore's link, you'll see that they offer people the ability to purchase e-books. This is how an independent bookseller can reinvent themselves and make their product useful to more people. You can purchase and download your e-book from their web site. With thousands of titles, you don't have to be the captive of Amazon or BN. If you followed the earlier link to Jarek Steele's blog, you read about the Justice Department's lawsuit claiming price fixing in e-book retailing. If you're interested in following up more on the lawsuit, read this post and follow the links at the bottom of the page. Essentially, Amazon got the Justice Department to claim that allowing free price ranges on e-books was a monopoly and therefore, not allowed. Amazon would gain most of the share of e-book commerce and put others out of business. The time for comment on this is over so now we wait to see what will be decided. Competition is good, right? The ability of people to have choice in products is good, right? If you're still with me, I'd like you to click this link and read this post. Another place that has had to reinvent itself is the local public library. This article talks about the challenges libraries face in a digital world. If you value any sort of access to any kind of book from Cat in the Hat through Shakespeare and on to Mein Kampf (I read a translation of this in college. Boring.) or the current squee, Fifty Shades of Gray, you owe it to yourself to read and ponder the challenges to libraries as presented in this article. "We can’t do any of this with most ebooks. The files don’t live on library servers. License terms can restrict copying, archiving, and format shifting. This is why the Amazon/Overdrive deal was news; if libraries had had the ability to shift those ebooks to .mobi format on their own, no deal would have been needed. This is why Jo Budler’s high-profile move to 3M was news: because Kansas’ contract let them keep the files during the move, but she had to fight to enforce that — and the contract language has since changed to prevent other libraries from doing the same. This is why it was news when HarperCollins imposed a 26-checkout limit, and Amazon deleted copies of 1984 from users’ Kindles. We don’t expect that books we own can vanish. But, of course, we don’t own ebooks; we merely license them. Their cultural memory isn’t ours to keep." HarperCollins imposed a 26-checkout limit on e-books? Amazon deleted 1984 from user's Kindles? I didn't know this and this makes me very, very uneasy. I don't want a Kindle or a Nook. I prefer paper cuts and scribbled margins and bookmarks and the ability to set my book down in a bathroom and not worry that I'll short it out or that I'm out $100 if I forget it. If I want to go back, 8 years from now and read The Colour of Magic, I will only have to visit the stash in the basement, not pony up another $7.99 or whatever it costs, if Terry Pratchett's works are even available for e-books, to read it again. I want to be able to send How the Grinch Stole Christmas to my nieces and nephews in any quantity and know that their parents can, as I have, memorize the words because it's read over and over and over, more than 26 times. But that's just me. I honestly don't believe e-books will replace paper books, but we do need to think long and hard about how we want our fiction, non-fiction, gardening, mystery, children's and all other categories of books delivered. 'Here,' I said, tossing Deane's copy of The Little Prince onto the table right at the front. The displacement-field technology worked perfectly--a single book landed on each of the hundred thousand tables. 'This is an UltraWord book,' I explained. 'Read the first page and pass it on. See how long it takes before you can't open it.'" I don't think that's the future I'd like to see.